Blues Make it to Quarter Finals at Kerry's expense. The Shannon Blues advanced to the quarter final of the Pat O’Brien Cup with a solid display against a gallant Kerry side in difficult, windy conditions. It was a game that Kerry will look back on and rue many missed opportunities in the second half. The wind played a factor as kicking frees into the gate end goal proved nearly impossible. Trailing by three points at half time, the kingdom lifted their efforts in the second half but having won several frees that would have been very scoreable under normal conditions, conditions were not normal and the ball had very little chance of making it in freetaker’s intended direction. The game opened at a fast pace and the Blues streaked into a four points to none lead to get things going. Nicky Murray, Simon Sinnott, Sean Moriarty, and James Hynes scored as the Blues were moving and passing the ball well. Waterville man Donnacha Fenton stemmed the Blues wave with a pointed free, and after the excellent Conor Mullen cancelled it out for the Blues, Kerry center back Kieran O’Connor put a massive effort over the bar to lift Kerry spirits. At the break there was very much a game on with three points separating the teams. The Blues Pat Murray looks to get this breaking ball. James Dooley at wing back and Ian Somers in the middle of the field in particular lifted the Kerry effort and the Kingdom generated several chances to score as the Blues back line committed several fouls. Fenton, however, was unable to cope with the strong breeze and put a couple over the bar, and Kerry remained scoreless. As the half wore on and Kerry failed to take advantage, the Blues found their rhythm of the first period and motored again through Mike McGowan, Mullen, Sean Moriarty, and James Hynes to put the lock down on the game. Moriarty and Hynes pointed three between them to make it a 0-7 to 0-2 final score. They Kerry football club would like to extend the greatest sympathy to Paddy Tanny and his family on the passing of his father. Blues: C. Wallace, S. Kelly, D. O’Brien, M. Keegan, M. McGowan, C. Mullen, P. Murray, D. Clarke, S. Moriarty, J. Hynes, K. Sullivan, G. Henry, N. Murray. Kerry: S. Leary, M. Godley, G. O’Caobhain, J. Dooley, K. O’Connor, P. Doyle, I. Somers, G. Cummings, T. Fitzgerald, D. Fenton, M. Taylor, J. Kennedy, T. Caobhain. Armagh-Notre Dame pulled off somewhat of a dramatic victory over Christopher’s to earn a quarter final game against their local Brighton rivals, Galway. The game was empty of scores in the first half as both sides floundered in front of goal, but the second was much more enjoyable. Christopher’s looked like pulling away only to be reined in and eventually overtaken by a determined Armagh-Notre Dame side. Dan Kenneally makes a clean catch this time. Mid-way through the first half the game remained scoreless, and it was only with the period winding down that either side chalked up a score. For the men in the orange jerseys it was Dominic Magill, and then for Christopher’s it was Owen Keohane who made it a point each at the break. Christopher’s opened the second half looking like they were about to steamroll their opponents. Some great play resulted in four points for Christopher’s. The quick ball into the corner forwards paid heavy dividends. Armagh-Notre Dame dug in however. Conor McGarry popped over a point, making it a one-score game. Midfielders Adrian Gunn and Kieran Sheerin made things difficult for their opposite numbers, and Pat Delaney ended up getting a second yellow card for rough play handing the Orchard men a numbers advantage with plenty of time left to play. Dominic Magill on the run for Armagh-Notre Dame. Armagh-ND kept up the tempo and dug deep in a big effort to get the season off to a good start, and their efforts eventually paid dividends. At the end of a fine move the ball ended up in the hands of McGarry, and a penalty resulted. McGarry was pulled down and Frank Meehan slotted the kick into the bottom corner. All square now and with Christopher’s frustration growing and the bit between the teeth for the Brighton team, veteran Darren Maguire popped over a free in the dying moments of the game to send his side through to the next round. Armagh-ND: O. Murphy, S. Redmond, S. McKenna, F. Meehan, N. Lowry, M. Graham, A. Gunn, K. Sheerin, G. Hall, D. Magill, M. Tiffany, C. McGarry, D. Maguire. Christopher’s: J. Duane, N. Ryan, L. Luke, M. Delaney, C. Murphy, P. Manning, D. Kenneally, J. Kenneally, P. Mannion, P. Delaney, L. Hickey, D. Keohane, R. Kenneally. The first round of the Pat O’Brien Cup was completed at the Irish Cultural Center with two games played in cold, wet conditions. Aidan McAnespies and Galway got the wins over the Shannon Blues and Kerry, and advance to Round 2. Galway had control over this one from the start. With 15 minutes gone the westerners held a 1-4 to 0-2 lead thanks to a productive effort at corner forward from Jamie Kehoe. The dual player notched a goal and two points. Eoghan Kavanagh was motoring in the middle of the field, and Peter Nolan his usual industrious self at half forward. Nolan and Walsh accounted for the balance of the Galway tally, while Kerry’s scores came from corner forwards Donnacha Fenton and Tadhg O’Ciaomhan. John Joe O'Neill and Padraig Doyle contest possession. It would require a major turnaround from Kerry if the Kingdom were to turn the tables in the second half. However, it did not materialize as Galway continued to apply the pressure and make a better first of the conditions. Leon Kelly added to the Galway tally, while a second goal from Kehoe put the matter to rest. A nice passing move involving Danny Reddin and Tom Walsh ended with Kehoe flicking the ball past the outcoming keeper and into the net. Nolan added a sixth point for Galway as the tribesmen advance to Round 2. Kerry: T. Fitzgerald, K. O’Connor, G. O’Ciaomhan, R.Coyne, M. Godley, J. Dooley, P. Tanny, H. Cummings, C. McGillicuddy, J. Whelan, P. Doyle, D. Fenton, T. O’Ciaomhan. Galway: P. McCourt, G. Bannon, P. McEvoy, JJ O’Neill, JJ Doyle, S. Gallagher, E. Kavanagh, L. Kelly, D. Reddin, P. Nolan, T. Walsh, J. Kehoe, S. Bannon. There was some needle in the second match of the day that boiled over just before half time with the result of both number 7s receiving their marching orders. Some niggle between the Blues James Feeney and McAnespies Gary Feeley finally came to blows as the first half was about the conclude and each player was sent to the line by referee TimmyO’Neill. The game itself was quite an entertaining affair despite the miserable conditions. Both teams played some good passing football, but McAnespies had that little extra to see them through. Blues stalwart, Brendan Driscoll clears the ball. 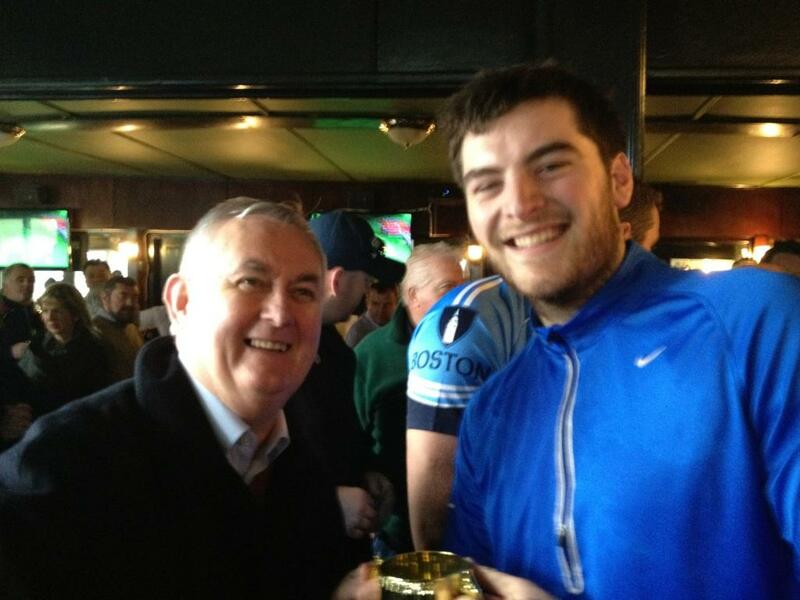 The first half opened with Colm McCrory putting two over the bar as the current holders moved the ball well. The Blues responded through a Kieran Sullivan point. Macs had Niall Gallen, O’Neill, and McCrory running well, while for the Blues it was Shane Kelly, Conor Mullen, and Sean Moriarty leading the charge. Stephen Magill expertly slotted a free over just before the half and Macs led by 2 at the break. With each side reduced by a man to start the second half, McAnespies extended their lead. Neil Donaghy found room on the edge of the small square and could have gone for goal, but took the sure option. Shane Lynn, who was introduced at the break added another, and Macs kept inching ahead. The Blues almost pulled even with Sean Moriarty bearing down on goal, but Ryan McCrystal pulled off a great save to keep his sides lead intact. McCrory added a sixth point for McAnespies, and Mullen one for the Blues, but such was the tight nature of the game that four points provided McAnespies with a comfortable lead to end the game. Blues: D. Hawes, M. Green, S. Kelly, C. Mullen, B. Driscoll, M. Keegan, P. Murray, S. Moriarty, C. Fitzgerald, J. Feeney, K. Sullivan, N. Murray, D. Kenny. Macs: R. McCrystal, M. Bogue, N. Gallen, A. McAlinden, C. Dempsey, G. Treanor, G. Feeley, G. O’Neill, C. McCrory, N. Donaghy, S. Gallen, S. Magill, E. Hamill. The 3 winners of these games will go into the quarter finals with the 5 Round 1 winners, Donegal, Wolfe Tones, Connemara Gaels, Galway, and Aidan McAnespies. The Pat O'Brien Cup first round continues Sunday, April 22 with Kerry meeting last years surprise package, Galway at 1:00 while Shannon Blues will take on defending champions, Aidan McAnespies at 2:00. Disappointed to see that the challenge game versus New York that was scheduled for April 21 at the ICC in Canton has been cancelled, especially since this April a Boston selection could have given New York a real rattle. Last seasons game in Canton ended up with a comfortable win for the visitors from New York, but the Boston side were crying out for a couple of scoring forwards that would have made the game much closer. One year later, there are a few scoring forwards in the Boston area. That said, the games are more a part of New York's preparations for the Connaught championship. Two Boston clubs lost players to injury following last year's outing in Gaelic Park, New York. and one of those is still out for the first part of this season - a heavy price to pay. 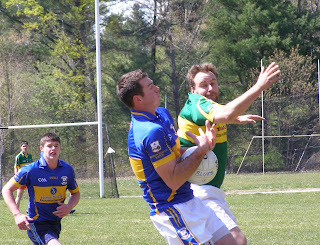 The Pat O'Brien Cup begins this coming Sunday, April 15, with the Wolfe Tones likely to field as strong a home based side as Boston has seen since the halycon days of the 1990's and early naughties and will meet Mayo. Christopher's who meet Donegal are celebrating the 25th anniversary of the club, while theGaels and Cork close out the day's action. 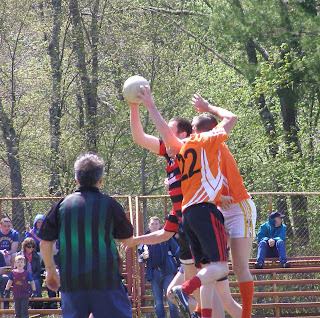 Last weekend saw the footballers of Wolfe Tones and Cork travel south to New York to compete in the 7-a-side competition. Donegal Philadelphia traveled northwards, while local teams Armagh, Cavan, and Kerry also entered the early-season contest. Despite a gallant show, Cork did not make the semi-final stage and lost key player Mick Lyons for 4-6 weeks with an ankle injury. 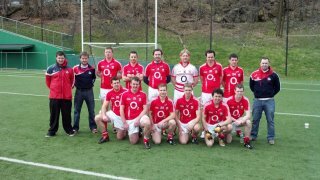 The Tones traveled with a strong panel of players however, and defeated Cavan by 5 points in the semi-final. In the final game the Boston side beat Kerry by eight points, with Cormac J Power getting the player of the tournament award. 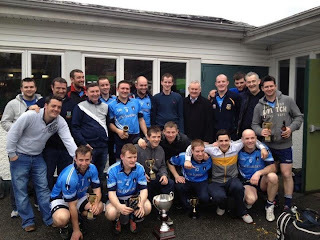 Players who fielded for the Tones were Gary Brilly, Mike (Frodo) O’Brien, Kenny Regan, Sean Kelly, CJ Power, Marty Farrell, Collie Carr, Charles McCarthy, Hagan Walsh, Colm Larkin, Keith Gill, Gary Leonard, and Joe Sheridan. Congratulations to the Tones! with the Player of the Tournament Trophy.